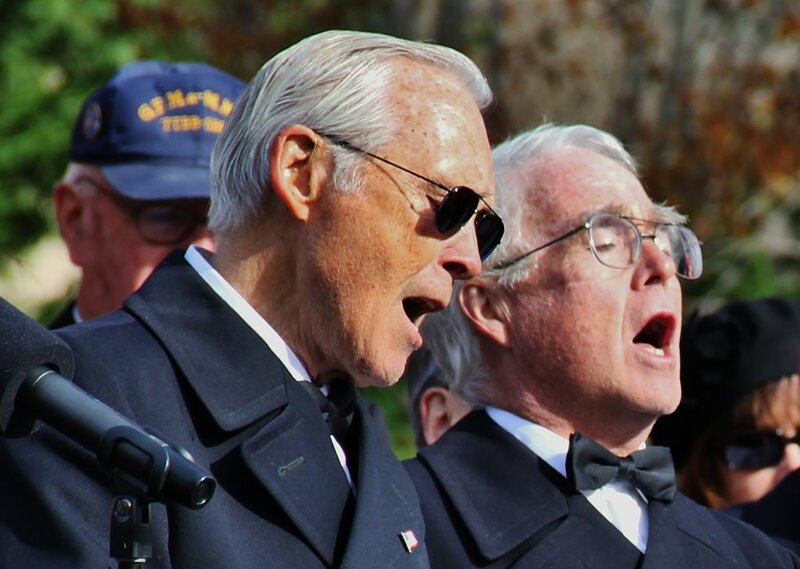 Members of the Greater Falmouth Mostly All Male Men’s Chorus, shown here in their Veteran’s Day performance. The spring concerts, titled, “We the People: Songs of Protest, Patriotism, and Peace,” will meld folk and popular music about American history with quotations from influential US and world leaders. Selections will include “The Battle Hymn of the Republic,” “Tenting Tonight,” “Proud Mary,” “Danny Boy,” and others. The chorus will be accompanied by Debbe Carlisle on piano and several additional instrumentalists. New members are welcome and are encouraged to try out the chorus by attending rehearsals during the first couple of weeks of the season. Auditions are not required. Members and prospective members are invited to a GFMAMMC potluck social on Saturday, March 1, from 2 to 5 PM. For more information, call Marcy Franklin Lerner at 508-564-0054 or email info@falmouthmenschorus.org. Dulina, the artistic director of the chorus, joined the chorus in the fall. Under Dulina, GFMAMMC membership has increased to 36 members, up 20 percent over the previous year. The chorus sings popular, American, folk, and contemporary songs in four-part men’s harmony. Concerts are held in the fall and the spring, and the chorus also sings for Falmouth town observances of Veterans Day and Memorial Day. The spring concerts will be held on Saturday, June 7, at 7:30 PM, and on Sunday, June 8, at 3 PM, at St. Patrick’s Church, 511 Main Street, Falmouth. For more information, visit www.falmouthmenschorus.org or call Marcy Franklin Lerner, president of the chorus, at 508-564-0054.